service, family owned and operated florist for all occasions, you can count on us for the highest quality product. Our specialties include: fresh flower arrangements, unique European basket gardens, blooming and green plants, wedding flowers, fruit and gourmet baskets, and balloon arrangements. We hand pick all flowers and plants on a daily basis to insure the freshest and highest quality available. 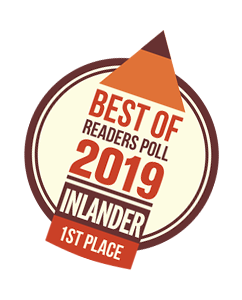 Voted Spokane’s #1 Florist in both the Inlander and Spokane Coeur d’Alene Living Magazine for 12 years in a row! Spokane’s largest florist, Liberty Park Florist & Greenhouse has been in Spokane since 1929. We are a full service, family owned & operated florist for all occasions. We hand pick all flowers & plants on a daily basis to insure the freshest & highest quality available.